6.D-ring locking carabiner: Light,b and durable, used for hanging light weight stuff, NOT applicable for climbing,swing,hammock,punching bag, dog leash and so on. Suit for Downhill, Skiing, Ice Climbing Gear, Climbing, Hiking, Camping, Downhill, Engineering protection, Tree Stand Accessories, Training, Aloft-work, Caving, Abseiling, etc. Rock climbing and mountaineering are dangerous. SAFETY FIRST. You are responsible for your own actions and decisions, appropriately evaluate yourself with this harness's capabilities and limitations. 1x Friendly after-sales service: Any concerns, please contact us by message, we will solve it within 24 hours. THICKEN & PROFESSIONAL: CE Certified, the rock climbing harness is made from polyester with a reinforced tie-in point and stitching; With high bearing capacity and durability, the climbing gear is extra durable, no worry about the safety. 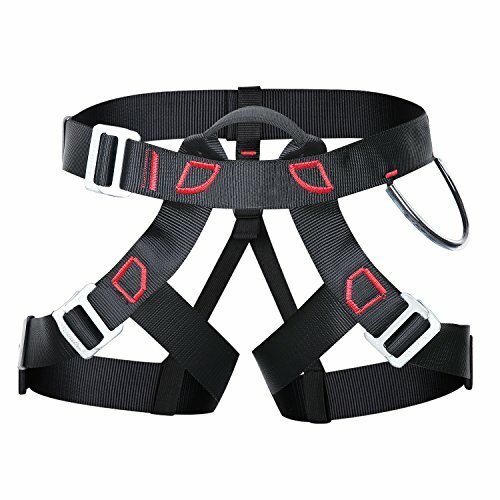 OUTSTANDING DETAIL: The durable bearing loop, adjustable metal buckle, reinforced belt and comfortable leg belt, all these details make the tree climbing harness more durable, safe and comfortable, just add the mountain climbing harness to your cart without hesitation to get a superexcellent experience! If you have any questions about this product by UNIQUEBELLA, contact us by completing and submitting the form below. If you are looking for a specif part number, please include it with your message.